We all have dreams, don’t we? But are our finances in line with our dreams? 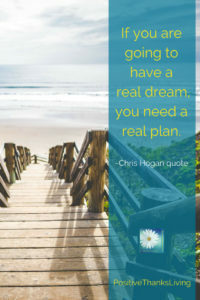 If you are going to have a real dream, you need a real plan. 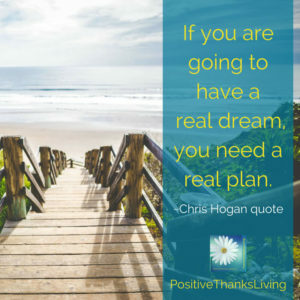 Chris Hogan is a representative of Dave Ramsey’s Financial Peace program and helps spread Dave’s message of financial hope to audiences everywhere. 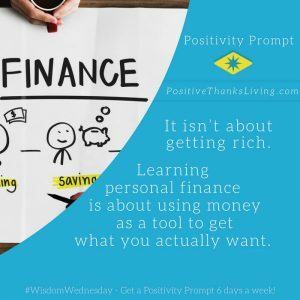 Even if you find talking about finances and budgeting an uncomfortable subject, gathering financial wisdom and putting it into practice can be a powerful tool on the way to your dream! 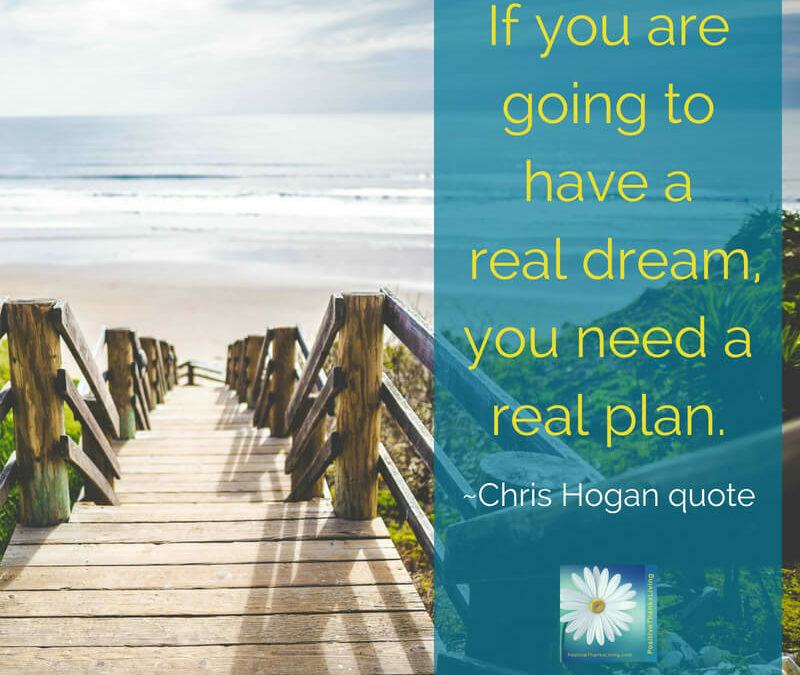 What needs to happen in your financial life as you meet goals and work toward your dream? 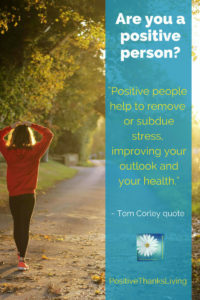 Don’t let yourself believe that being a positive person means you need to be a “yes-person”. 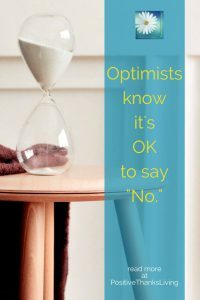 Though “yes” is a powerful way to navigate life, there are also times where a well-placed “no” is completely appropriate for an optimist. and more – this is the article that inspired me! I have a friend who uses a humorous response when he doesn’t want to participate. He says, “Count me out!” And then he smiles, because he’s not being negative, but rather leaving the space, funds and time for those activities which align with his chosen values. 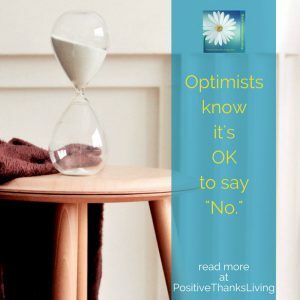 What are you currently saying “no!” to? 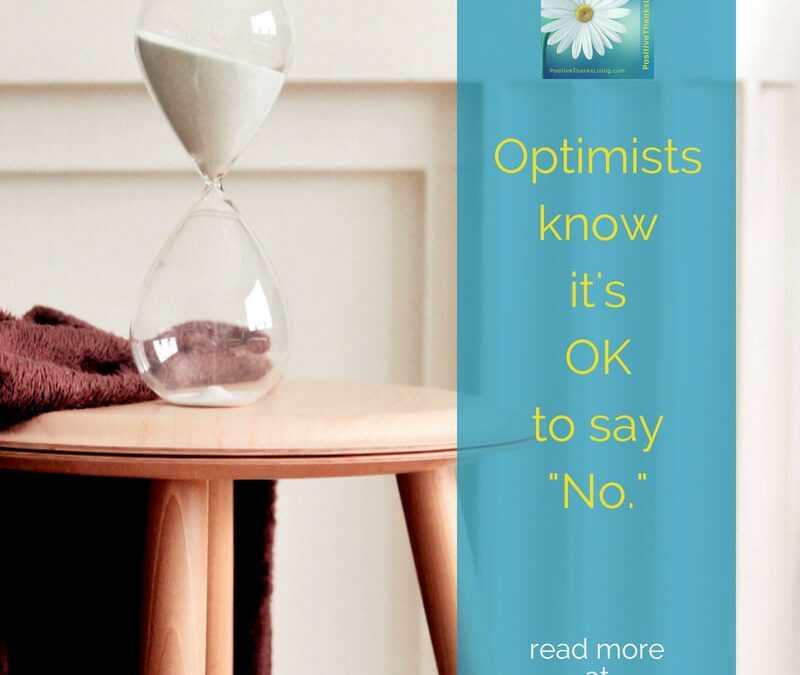 What would make you healthier, wealthier and wiser if you did say “NO!”? 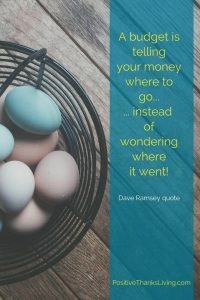 Dave Ramsey has focused for years on providing options for those who want to have peace with what some call the “money monster”. We are joking, of course, when we reference money as the “Frankenstein Monster”. Well… sort of. Budgeting is one part of that peace with money. But not all of us see the idea of budgeting as a positive idea. Subtract your expenses from your income. Track your spending to see if your spending is aligning to your plan. These four steps are expanded here. And there’s an app for that budgeting idea also. 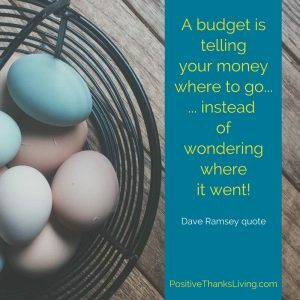 I’m sure there are many ways to make and follow a budget… just try searching for “How to make a budget.” and you’ll be reading for quite a while. 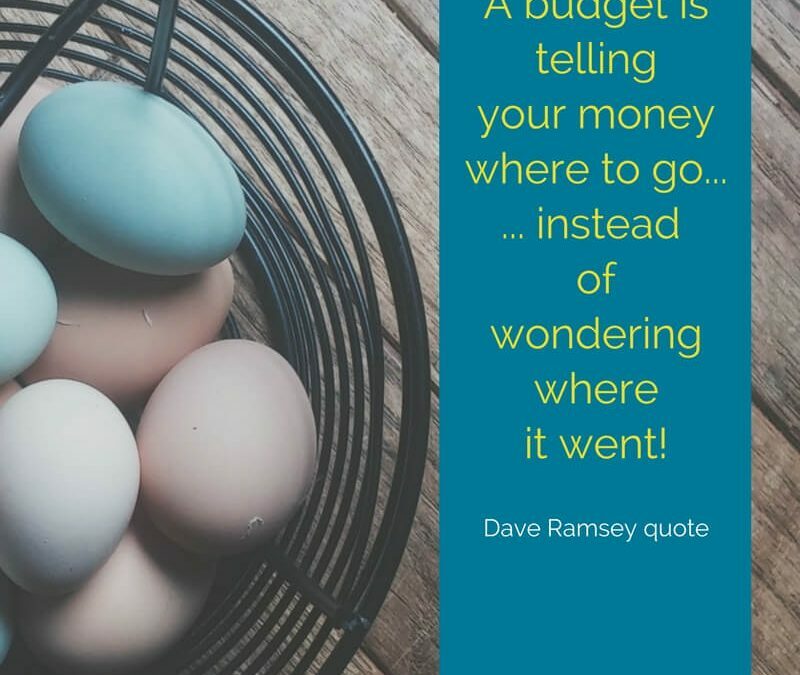 A budget is telling your money where to go… instead of wondering where it went. 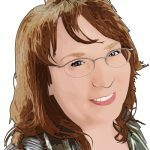 If you wonder where your money went at the end of the month – or when you fill out your income tax forms – perhaps it’s time to discover – or re-discover – what working with a budget might feel like. Maybe it won’t be as bad as you might think? How do you feel about using a budget? Do you know what you really want? I’m referring to the things you want to own, the places you want to visit, the activities you’d like to invest in, etc. I challenge you to try this exercise. You might be surprised. And I’m guessing that if you looked at your list when it’s complete, you might replace some of the words with other words, and you might erase some items all together. 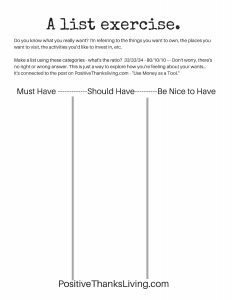 Here’s a little PDF to download with those three columns – click HERE – and print! Why am I suggesting this activity? Too often we have these unspecified “wants” floating around in our head, and it leads to feeling dissatisfied with where we currently are. 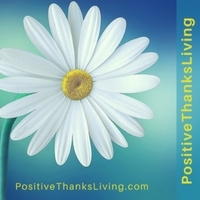 are powerful tools in the fight to feel a positive movement forward in finances. Am I there right now? Nope. But I’m progressing. Personal Finance: It isn’t about getting rich. 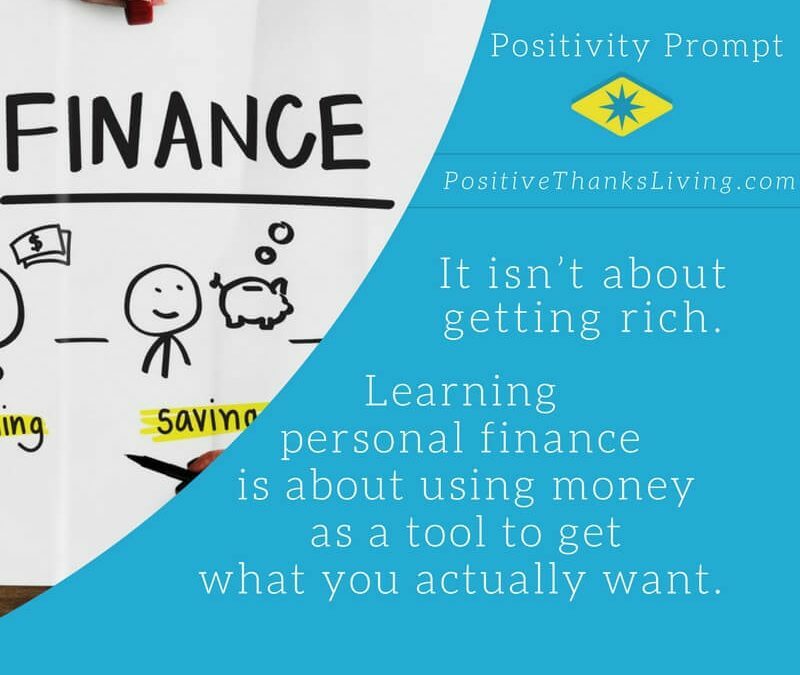 Learning personal finance is about using money as a tool to get what you actually want. What about personal finance “teachers” or models? Dave Ramsey’s Financial Peace program is a valuable tool to move forward in your personal finances. I receive an email every day from an accountant who focuses on Rich Habits. He describes what he has discovered after years of researching the daily success habits of his wealthiest clients Nothing he suggests is woo-woo or get-rich-quick, rather the habits he suggests are quite logical and do-able for anyone at any age or stage. I’ve also read a couple of his easy-to-read books. I’m guessing it’s nothing we’ve not heard before, but he does have a very down-to-earth way of stating things. And his habits encompass much more than doing stuff with dollars and cents. But it all makes sense. 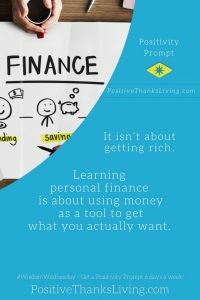 Do you have any personal finance people you’ve learned from and would recommend? Could you share what you like about those people/programs? This is an area in which I’d like to grow in a positive way, and maybe your recommendation could add value to all of us! Please leave a comment! However, just to be clear, security does not come from money, rather we should seek God’s wisdom. 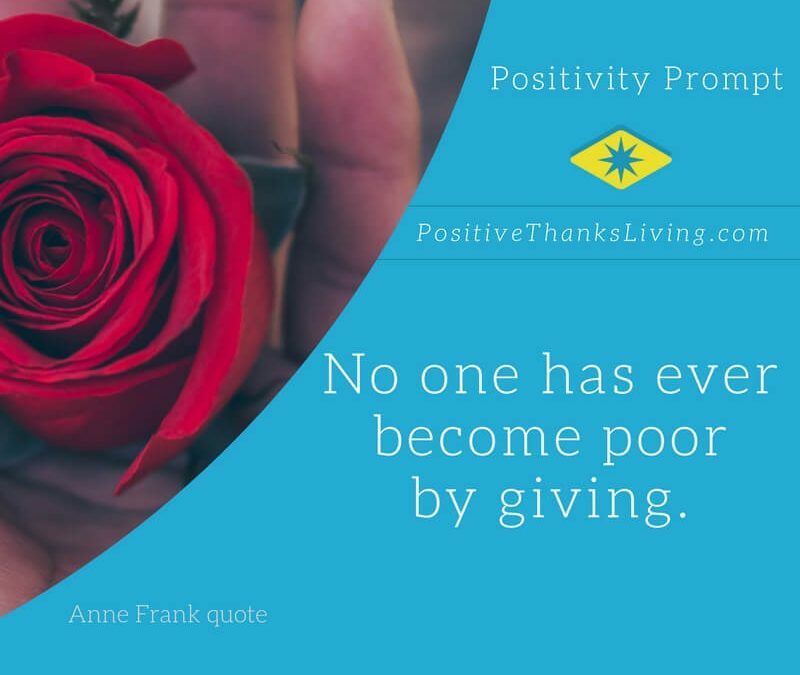 Anne Frank, the young Jewish girl who spent two years in hiding during the Second World War, had many wise insights. This quote is from “The Diary of a Young Girl” a book published from her diary in 1947. 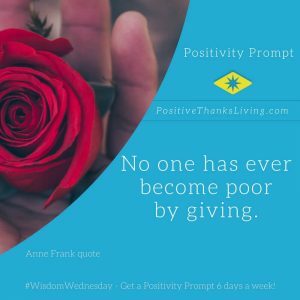 As a girl born into a practicing Jewish family, Anne would have been familiar with the Old Testament concept of tithing – giving a 10th of everything to God. (Leviticus 27:30-33, Numbers 18:21-24) Of giving thanks to God with what they had – Deuteronomy 14:22-27, and giving to the poor every third year – Deuteronomy 14:28-29. The Jews were taught that they would prosper if they tithed. Jesus and His disciples expanded on giving by suggesting we should give anonymously, voluntarily, expectantly, with joy and thanksgiving, and to raise our own sense of why we give. 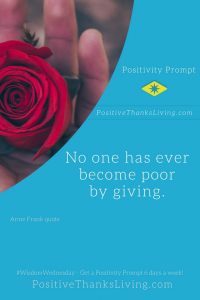 Health: giving may lower the stress hormones of cortisol – the more money people gave away the happier they were and the more generous by helping, the healthier they were. Relationships: being generous and serving with your spouse creates a happier marriage. And then there are the intangible benefits like feeling thankful for what you have, connection to something greater than yourself, and setting a good example for the next generation. The act of giving provides much more than the little we give away. Consider what you’re giving now. 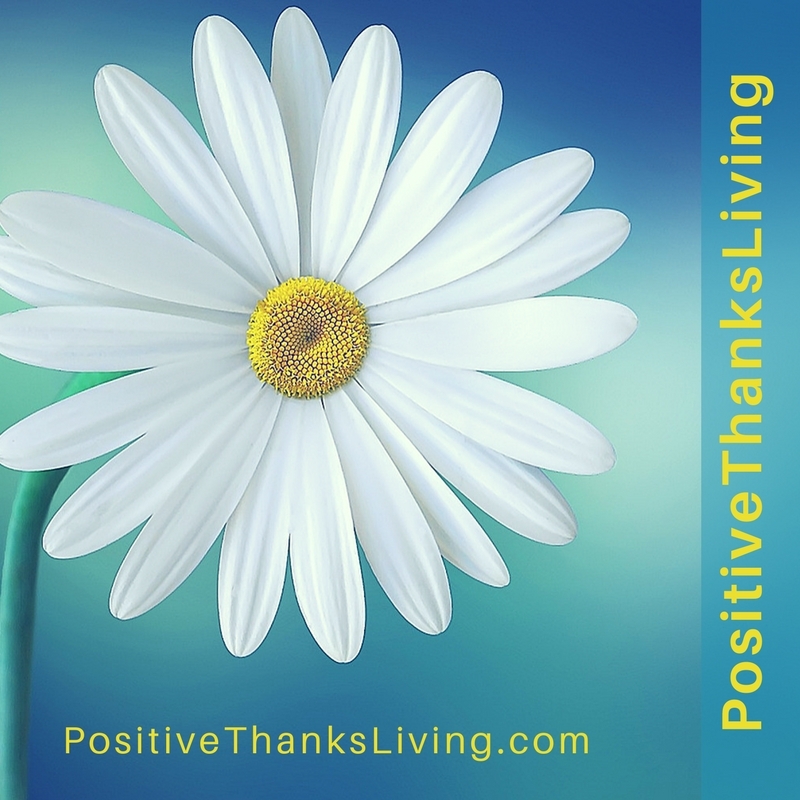 Do you want to feel happier, healthier, have better relationships, provide a greater example of good, become connected to something greater than you are and be even more thankful?